The vertical toolbar appears on the left sidebar (see the following figure) when an EER diagram tab is selected. The tools on this toolbar assist in creating EER diagrams. Clicking a tool changes the mouse pointer to a pointer that resembles the tool icon, indicating which tool is active. These tools can also be activated from the keyboard by pressing the key associated with the tool. Hover the mouse pointer over a toolbar icon to display a description of the tool and its shortcut key. A more detailed description of each of these tools follows. The standard mouse pointer, located at the top of the vertical toolbar, is the default mouse pointer for your operating system. Use this tool to revert to the standard mouse pointer after using other tools. To revert to the default pointer from the keyboard, use the Esc key. The hand tool is used to move the entire EER diagram. Left-click on this tool and then left-click anywhere on the EER diagram canvas. Moving the mouse while holding down the mouse button changes the view port of the canvas. To determine your position on the canvas, look at the Model Navigator panel on the upper right. If the Model Navigator panel is not open, use View, Windows, Model Navigator to open it. To activate the hand tool from the keyboard, use the H key. You can also change the view port of an EER diagram using the Model Navigator panel. See Section 9.1.1.9, “The Model Navigator Panel”. Use the eraser tool to delete objects from the EER Diagram canvas. Change the mouse pointer to the eraser tool, then click the object you wish to delete. Depending upon your settings, the delete dialog box should open, asking you to confirm the type of deletion. The delete action of the eraser tool is controlled by the general option setting for deletion. Before using the eraser tool, be sure that you understand the available options described in Section 3.2.4, “Modeling Preferences”. To activate the eraser tool from the keyboard, use the D key. You can also delete an object by selecting it and pressing Control+Delete or by right-clicking it and choosing Delete from the pop up menu. The layer tool is the rectangular icon with a capital L in the lower left corner. Use the layer tool to organize the objects on an EER Diagram canvas. It is useful for grouping similar objects. For example, you may use it to group all your views. Click the layer tool and use it to draw a rectangle on the canvas. Change to the standard mouse pointer tool and pick up any objects you would like to place on the newly created layer. To change the size of a layer, first select it by clicking it. When a layer is selected, small rectangles appear at each corner and in the middle of each side. Adjust the size by dragging any of these rectangles. You can also make changes to a layer by selecting the layer and changing properties in the Properties panel. Using the Properties panel is the only way to change the name of a layer. To activate the layer tool from the keyboard, use the L key. For more information about layers, see Section 9.1.7, “Creating Layers”. The text tool is the square icon with a capital N in the top left corner. Use this tool to place text objects on the EER diagram canvas. Click the tool, then click the desired location on the canvas. After a text object has been dropped on the canvas, the mouse pointer reverts to its default. To add text to a text object, right-click the text object and choose Edit Note... or Edit in New Window... from the pop-up menu. You can manipulate the properties of a text object by selecting it and then changing its properties in the Properties panel. To activate the text tool from the keyboard, use the N key. For more information about text objects, see Section 9.1.9, “Creating Text Objects”. Use the image tool to place an image on the canvas. When this tool is selected and you click the canvas, a dialog box opens enabling you to select the desired graphic file. To activate the image tool from the keyboard, use the I key. For more information about images, see Section 9.1.10, “Creating Images”. Use this tool to create a table on the EER Diagram canvas. Clicking the canvas creates a table. To edit the table with MySQL Table Editor, right-click it and choose Edit Table... or Edit in New Window... from the pop-up menu. You can also double-click the table to load it into the table editor. To activate the table tool from the keyboard, use the T key. 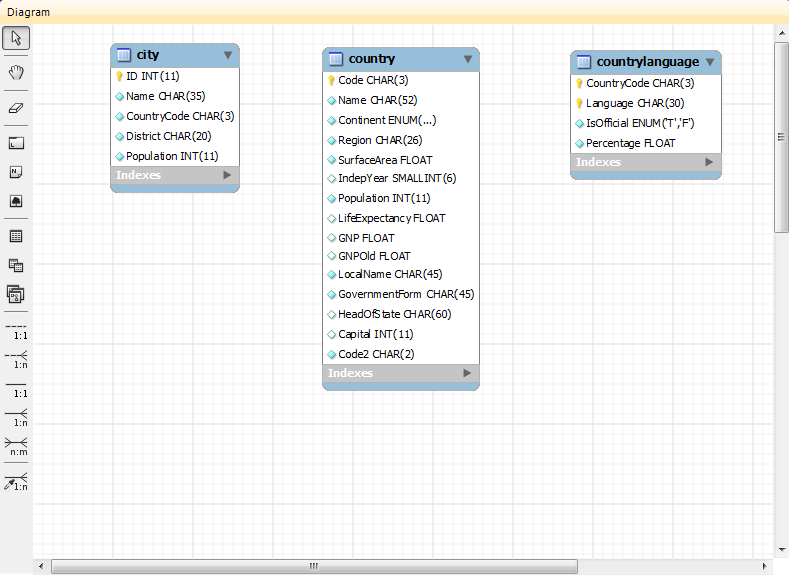 For more information about creating and editing tables, see Section 8.1.10, “MySQL Table Editor”. Use this tool to create a view on an EER Diagram canvas. When the table tool is activated, a schema list appears on the toolbar below the main menu, enabling you to associate the new view with a specific schema. You can also select a color for the object by choosing from the color list to the right of the schema list. After selecting this tool, clicking the canvas creates a new view. To edit this view, right-click it and choose Edit View... or Edit in New Window... from the pop-up menu. To activate the view tool from the keyboard, use the V key. For more information about creating and editing views, see Section 9.1.5, “Creating Views”. Use this tool to create a routine group on the EER Diagram canvas. When this tool is activated, a schema list appears on the toolbar below the main menu, enabling you to associate the routine group with a specific schema. You can also select a color for the routine group by choosing from the color list to the right of the schema list. After selecting this tool, clicking the canvas creates a new group. To edit this view, right-click it and choose Edit Routine Group... or Edit in New Window... from the pop-up menu. To activate the routine group tool from the keyboard, use the G key. For more information about creating and editing routine groups, see Section 9.1.6.2, “Routine Groups”. These tools appear at the bottom of the vertical tool bar. Hover the mouse pointer over each tool to see a text hint that describes its function. For more information about relationships, see Section 9.1.4, “Creating Foreign Key Relationships”.